There are times when you may need to send a file to Northern Hills Software that is too large to email. 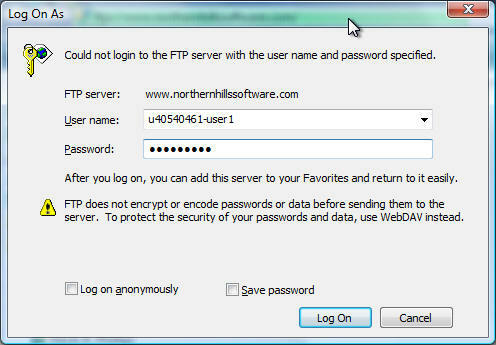 If this is the case, Northern Hills Software will define a "FTP" account for you for transferring the file to our web server. 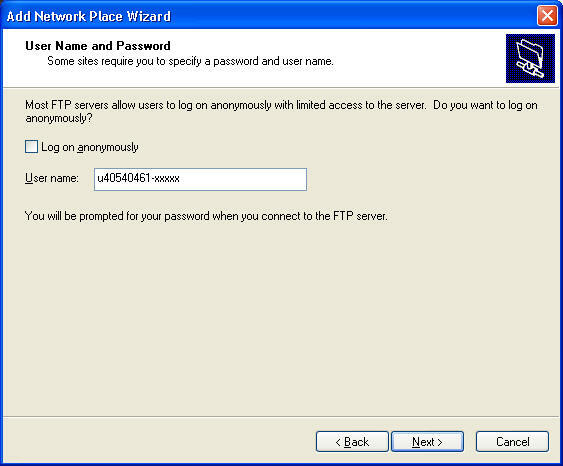 ("FTP" stands for "File Transfer Protocol") The account we define will be a private connection between yourself and Northern Hills Software, no one else will have access to it or the data that you send us. Once we have worked through the issue that prompted the request for data, the account will be deleted along with the data that you sent. along with the user name and password provided by NHS. 1. You need to have an internet connection. Dial-up will work but of course will be much slower than a broadband connection. 2. 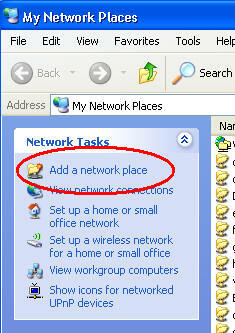 Go to "My Computer" and select "My Network Places" or you may find a "My Network Places" icon on your desktop. 3. Under "Network Tasks" at the left, select "Add a network place". 4. 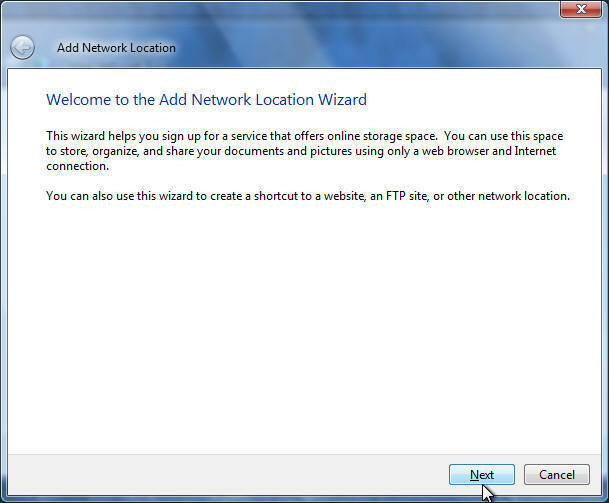 You will see the "Welcome" screen for the wizard, press "Next"
6. 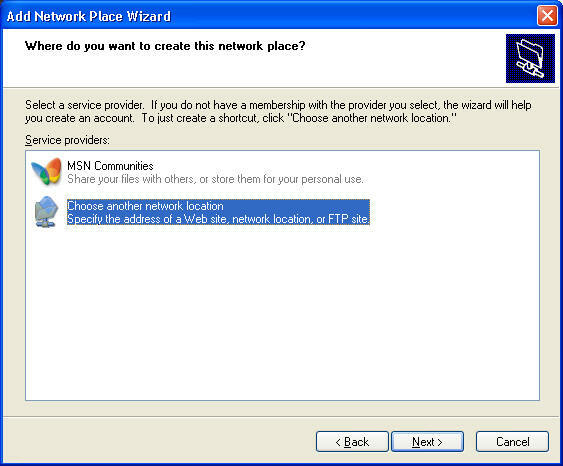 Select "Choose another network location" and press "Next"
7. 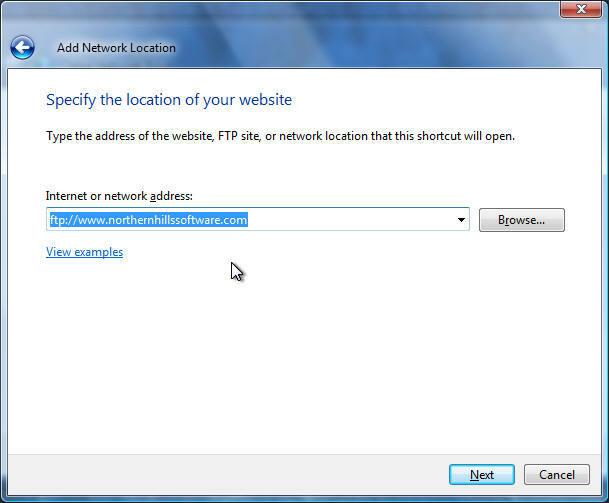 Enter the following information in the internet address field then press "Next". 8. 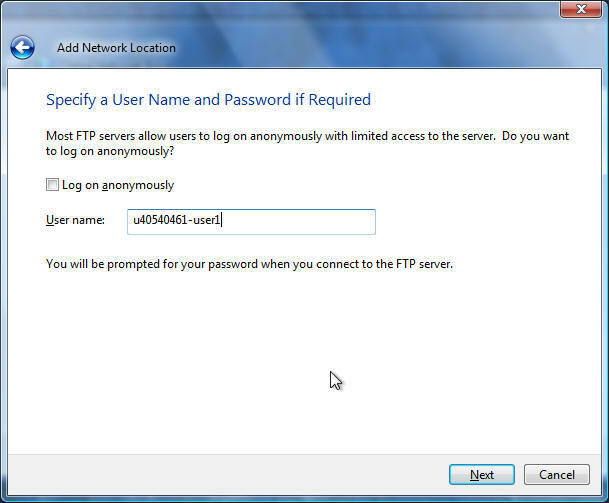 Uncheck the "Log on anonymously" box and enter the user name provided to you by Northern Hills Software. (Example shown is for illustration only, you must have a user name and password provided by NHS) Press "Next". 9. 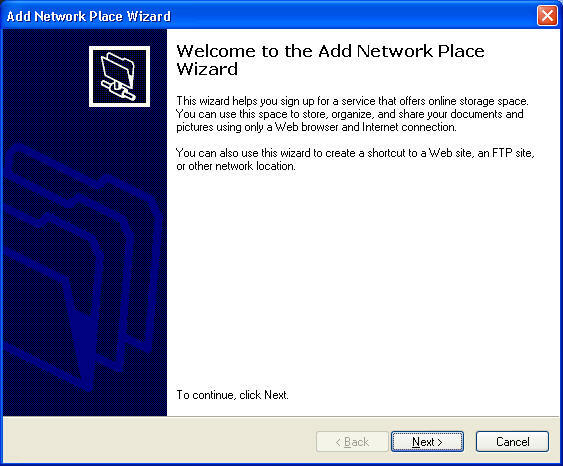 Type in any name you wish for the "name of the network place". Press "Next". 10. Click "Finish". You may wish to select "Open this network place when I click Finish". 11. If you did select "Open this network....", then you will be prompted for a userid and password. Example shown is for illustration purposes only, you must use the user name and password provided by NHS. You also may wish to select the "Save password" option so next time you can connect more easily. Press "Log On". The example below shows how it can be done with Windows Vista and Windows 7 and no additional software. 1. Double click on the "Computer" icon on your desktop. If you do not have this icon, press the Windows "Start" button and type in "Computer", then select "Computer" from the search list. 2. 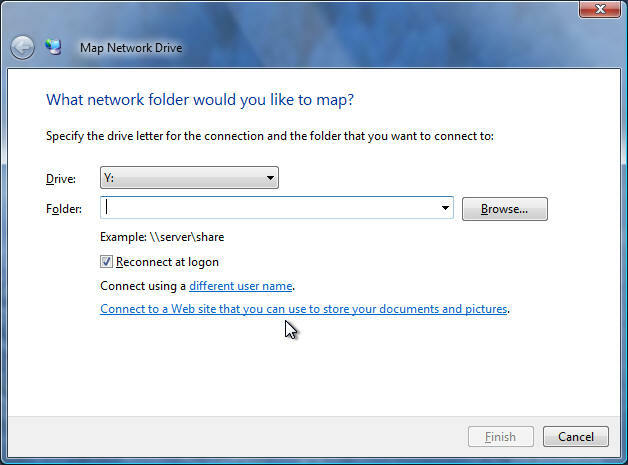 At the top of the "Computer" window, press "Map Network Drive". 3. Click on "Connect to a Web site that you can use to store your documents and pictures". 5. 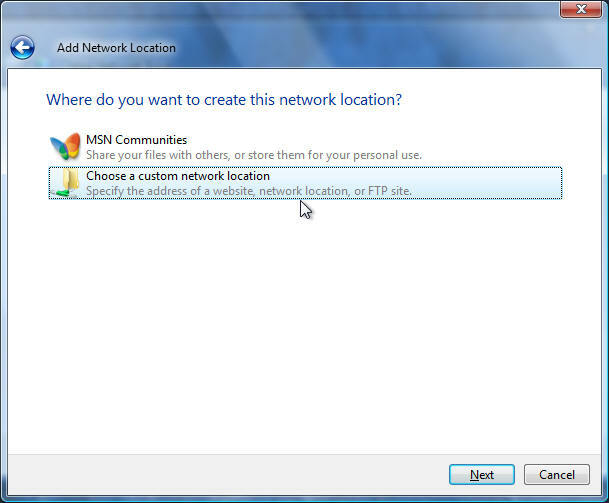 Double Click on "Choose a custom network location"
6. 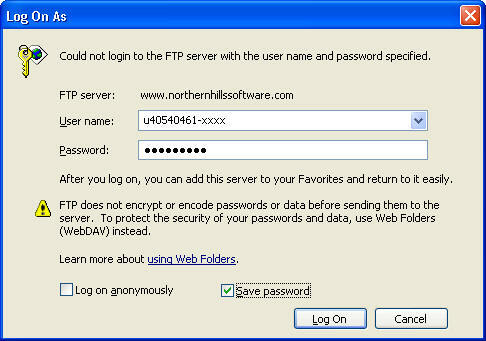 Enter ftp://www.northernhillssoftware.com then press "Next"
7. 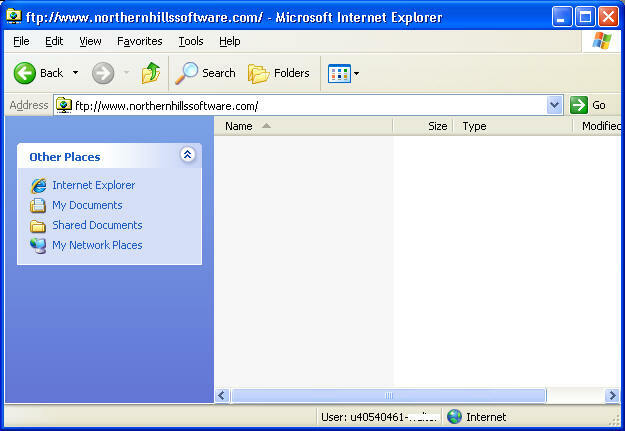 Uncheck the "Log on anonymously" and enter the user id given to you by Northern Hills Software. Press "Next". 8. You can enter a name you want to call this connection or leave the default. Press "Next". 9. Leave the check box selected, then press "Finish". 10. Enter the password given to you by Northern Hills Software (and select "Save Password" if you don't want to enter it again on future connections). Press "Log On"
11. 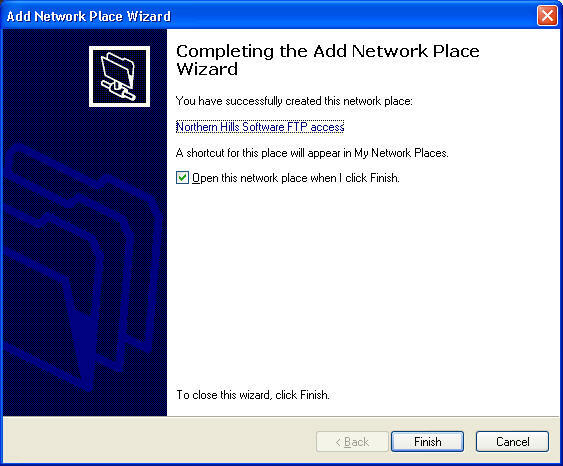 You will now have a connection to the private area given to you by Northern Hills Software, you can now open another "Computer" window and drag and drop items into the "ftp site".